Hotel Pullman Berlin Schweizerhof. Book your hotel now! 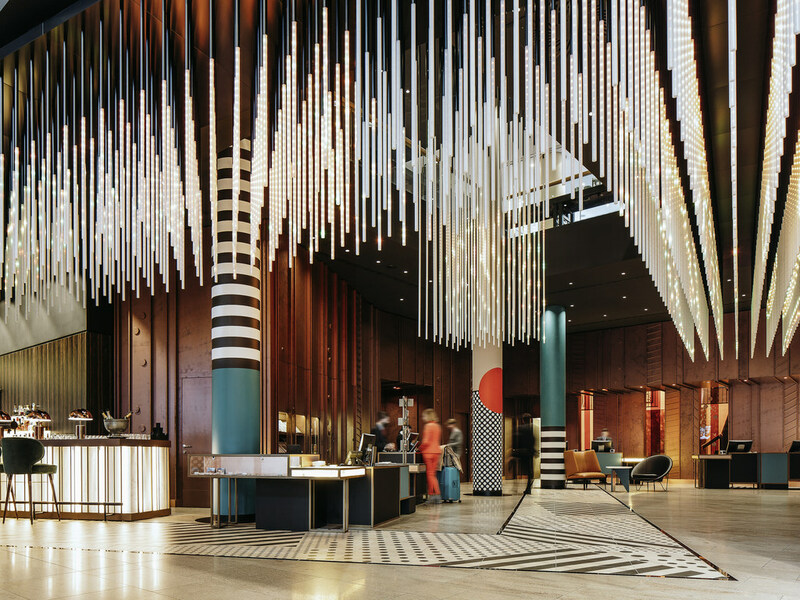 The Pullman Berlin Schweizerhof hotel is the ideal starting point for a voyage of discovery in Berlin. Several of Berlin's highlights are within walking distance of the hotel or are just a short drive away. The hotel has been redesigned in the Bauhaus style, combining an avant-garde interior with simple functionality. It also features 377 rooms and suites, 18 conference rooms and the "BLEND - berlin kitchen & bar" restaurant, as well as a Fit and Spa Lounge with the largest hotel pool in the city. Our 377 rooms and suites are as stylish as they are functional and have all of the modern amenities you would expect. Inspired by the city's multiethnic population, the BLEND berlin kitchen and bar restaurant mirrors the spirit and the soul of the melting pot of Berlin: modern and urban with a creative twist. Our contemporary "9.00 PM" lobby bar is open daily from 11am to 2am and serves all kinds of drinks plus hot and cold snacks. This is the perfect place for our guests to enjoy good conversation with a cold beer or glass of wine in hand. A very nice hotel. Good value for money. The standard rooms are a bit small, but very comfortable. Nice design. Great breakfast. Staff is very friendly. EXTREMELY SATISFIED WITH HIGH LEVEL OF FRIENDLY PROFESSIONALISM. Overall, the Pullman Schweizerhof Hotel, Berlin was Five-Star luxury. The staff are highly trained and extremely professional and very friendly. A warm welcome awaits the new guests. Nothing was a problem and each member of the front-desk/ reception staff knew the guests by name, ensuring all was well. The guest rooms are very spacious and comfortable, cleanliness of the highest standard - with every amenity on hand. A wide choice on offer at breakfast each day. A 'must' when in Berlin. Highly recommended. Enjoyed the stay and loved the upgrade. Room is excellent, bar is also good however restaurant food can be disappointing. A wonderful hotel in all respects! Everything was impeccable. The room, the hotel staff, the breakfast, the comfortable bed, the soft linen, the pillows, the tea set... I can go on and on with this ‘appreciation’ list. Unfortunately the swimming pool/sauna was closed because of renovation but we used the one in the Intercontinental just opposite the street. The stay was actually quiet OK; I only had an unfortunate experience during the booking process. Initially, I booked through the Daimler event system but never got a confirmation of the booking. I then went on to booking.com and did my own booking, which was more expensive. I paid in advance and later fond out that there was a double booking. The only thing that the hotel could do is to cancel the Daimler booking free of charge and charge me the hire amount. I found this treatment way below standards of a chain like Accor. Was very convenient being in the same hotel as the Handelsblatt conference. Generally a very nice hotel, the room has all it needs, the breakfast is good as well and the staff is friendly and make guests feel welcomed. Too expensive without the Handelsblatt offer, but with the offer good value. The hotel is lovely, relaxed, comfortable. I liked the choice of pillows available in the room - there was the perfect one for me. I had hoped to use the spa, shame it meant a short walk across the road but understand when refurbs happen. we are very satisfied, only that you could contact us, that the pool is not working. I supose the reason for that is cancelation od staying in your hotel. So that is not on level of 5 star hotel. It was a great experience staying in this Hotel The Staff is very profesional, helpful and nice. The rooms are very comfortable and very good cleand. The deisgn of the restautant is very good and the Food was extremelly great. Thanks for an excellent experience. Relaxing, comfortable and unobtrusive care. Can’t fault it - enjoyed it all. Great lighting in main areas. Relaxing and calm , welcoming bar and restaurant, comfortable rooms well looked after. I like everything about your hotel, from the friendly welcome, the clean and practical rooms, the perfect breakfasts and thewhole atmosphere. We arrived late, but received help finding a 24hr chemist and an extra bottle of wine for the mini-bar. There were a few issues with the electricals in the room, but these were sorted out the next morning.